You still see this drape in the middle of Calcutta, worn mostly by village women or older city dwellers. The drape is much easier than the nivi, with two large pleats in front and the pallu wrapped twice around the top. 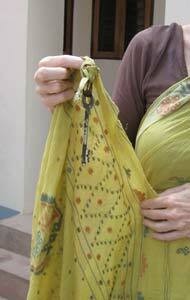 Traditionally the pallu end was weighed down with a house key - usually of the heavy skeleton variety. This drape looks most authentic with Bengali hand loomed sarees - if you don't have one, there's a great selection in the sarishop. Otherwise lighter weight cottons with smaller borders are recommended. The Bengali drape starts at the right hip. Make sure the bottom border is the right length, grazing the top of your feet. Draw the cloth around you from right to left keeping the bottom border at an even level all around and tuck into the waistline. To compensate for the difference between the hips and waist you can make two small pleats in the back. The grain of the fabric should fall perpendicular to your body. Now the top border should be tucked in with the pleats underneath. 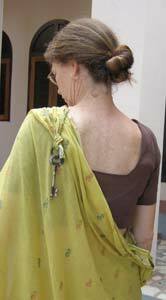 Take the top border of the sari and place it on your left shoulder, as shown in the second photo. Now you should grasp the top border midway between the waist and shoulder pull the sari out in front of you until there enough length to wrap around to your mid back. Gathering a couple inches together make a knot as shown in last photo. The knot should be tucked into the waist in the middle of the back - it will naturally migrate toward the right hip - easy enough to adjust by just sliding the knot to center to tighten it. The knot helps it to stay in the waistline. You can stash a few rupee coins the knot also, just in case. The position of the knot might need to be adjusted to get just the right drape, every body is different. You want the front fold coming from the knot to be a fall at a nice straight angle. The Bengali drape highlights the pallu, which is then again draped over the left shoulder, with just the very end corner going over the shoulder. The bottom border falls in a straight line down from the left shoulder. To keep it in place, the tradition has been to tie the house key to the end as a weight. You can use your imagination if you don't have a skeleton key to use - how about a petite purse or little brass bell?